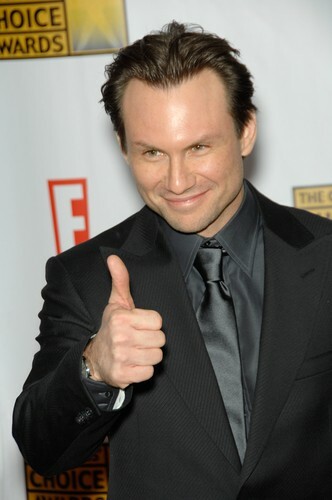 Veteran actor Christian Slater has been trying to break in to television for years. It’s only fitting that his best chance to do so is on a series called Breaking In. The Fox sitcom is kicking off its second season, and Christian Slater sat down with Ellen DeGeneres to talk about what he’s been up to. Click here to watch Breaking In season 1. Among the new developments for the show is the addition of Megan Mullally as the new head of the security firm where the characters work. Read Ellen’s interview with Megan Mullally. Christian told Ellen that he was inspired to take up the hobby of gardening after picking up herbs and seed packets at Whole Foods. I don’t know that he is in great shape, since he can’t seem to even pronounce Basil correctly. He said he expected his plant to die, but instead it grew when he watered it. Ellen was as impressed as I am that he figured out the basic concept of gardening. Among the vegetables in his garden is the Celebrity Tomato. He brought a picture of the sigle tomato his plant has sprouted, a modest success at best. He actually brought the tomato as a gift to Ellen, and I will concede that it’s an enormous tomato. When you consider that he’s growing all this on his balcony, I guess that’s not bad. Christian recently rescued a cat from his girlfriend’s sister, who was going off to college and couldn’t continue to care for the stray she’d adopted. The cat’s name is Thunder, and Christian brought a picture of it curled up in his laundry. Christian said he would work on teaching her sign language. Watch the Sign Language Cat YouTube video. He said he’s working on house training the cat using a self-cleaning litter box called the Litter Robot. He said he shows off the appliance to his guests, because he is so impressed with its efficiency. “Sounds like a fun time at your house,” Ellen observed. Click here to check out the Litter Robot for yourself. I think that Christian Slater should have to wear a t-shirt with a picture of his cat on it that says “That’s Thunder in my pants,” from now on.